In cells exposed to low linear energy transfer (LET) ionizing-radiation (IR),double-strand-breaks (DSBs) form within clustered-damage-sites (CDSs) fromlesions disrupting the DNA sugar-phosphate backbone. It is commonly assumed thatall DSBs form promptly and are immediately detected by the cellularDNA-damage-response (DDR) apparatus. However, there is evidence that the pool ofDSBs detected by physical methods, such as pulsed-field gel electrophoresis(PFGE), comprises not only promptly forming DSBs (prDSBs) but also DSBsdeveloping during lysis at high temperatures from thermally-labile sugar-lesions(TLSLs). We recently demonstrated that conversion of TLSLs to DNA breaks andultimately to DSBs also occurs in cells during the first hour ofpost-irradiation incubation at physiological temperatures. Thus, TLSL-dependentDSBs (tlDSBs) are not an avoidable technique-related artifact, but a reality thecell always faces. The biological consequences of tlDSBs and the dependence oftheir formation on LET require in-depth investigation. Heavy-ions (HI) are apromising high-LET radiation modality used in cancer treatment. HI are alsoencountered in space and generate serious radiation protection problems toprolonged space missions. Here, we study, therefore, the effect of HI on theyields of tlDSBs and prDSBs. We report a reduction in the yield of tlDBSsstronger than that earlier reported for neutrons, and with pronounced cell linedependence. We conclude that with increasing LET the complexity of CDSsincreases resulting in a commensurate increase in the yield prDSBs and adecrease in tlDSBs. The consequences of these effects to the relative biologicaleffectiveness are discussed. Ionizing radiation (IR) deposits energy as single ionizations or as ionizationclusters that generate base and sugar damages in the DNA [1–3]. Clusters of ionization can generate clusters of DNA damage withdifferent sizes and diverse damage composition (clustered damage sites, CDSs). Sugardamage can disrupt the sugar-phosphate backbone to generate DNA single-strand-breaks(SSBs) [2–4]. SSBs within CDSs form DNA double-strand-breaks (DSBs), which can havesevere biological consequences [1, 4–8]. DSBs can also be generated from CDSs populated with base damages through bi-strandedenzymatic opening during repair of the DNA sugar-phosphate backbone, or by combiningwith a SSB . DSBs initiate rapid signaling and complex regulatory processes affecting DNA repair,cell cycle progression, transcription, translation, as well as decisions ofprogrammed cell death and autophagy. These responses are currently integrated underthe term cellular DNA-damage-response (DDR) . Analysis of DDR after IR is based on the assumption that all DSBs form promptly.However, irradiation of plasmid DNA has shown that IR induces, in addition to sugarlesions promptly disrupting the sugar-phosphate backbone (prompt breaks), alsolesions doing so after temperature-dependent chemical processing (delayed breaks) . These thermally labile sugar lesions, TLSLs, constitute what areconsidered radiation-induced labile sites [1, 6, 10]. They can include diverse forms of sugar damage, abasic sites, and formsof base damage affecting sugar stability. Chemical evolution of such TLSLs to SSBswithin a CDS can generate additional, TLSL-dependent DSBs (tlDSBs) [3, 5, 10–13]. Until recently, it was believed that in mammalian cells evolution of TLSLs to SSBsand the generation in this way of DSBs is only possible at high, non-physiologicaltemperatures (~ 50°C) [14–16]. However, recent work from our laboratory [17, 18] provides evidence that IR induces TLSLs, which evolve within about1 h under physiological temperatures to SSBs and contribute, when presentwithin a CDS, to the formation of DSBs. These delayed-forming DSBs are thought to begenerated continuously during the first postirradiation hour and to add to DSBspromptly induced (prDSBs). The biological consequences of tlDSBs remain to beelucidated, but are likely to be significant. Since tlDBSs form within CDSs, the quality and quantity of which strongly depends onthe linear energy transfer (LET) of the radiation employed, it is particularlyimportant to study determinants of formation and rules of chemical tlDSBs processingafter exposure to high LET radiation. First experiments along these lines usingneutrons  showed a marked decrease in the yield of tlDBSs. Heavy-ions (HI) are a promising high-LET radiation modality increasingly used incancer treatment. Carbon ions are being used for the treatment of several types ofsolid cancers with promising results, and advanced treatment centers with ionaccelerators are under construction in several countries. Important research issuesrelated to the biological effects of HI and their relevance to the clinicalapplication have been identified for in-depth investigation . The nature of the DNA damage induced by HI and the contribution oftlDSBs to the biological effect is one such fundamental question. HI are also encountered in space and generate serious radiation protection problemsfor long-duration missions to the earth’s moon, or to Mars . In preparing for such missions, the risk of cancer from space radiationmust be estimated and mitigating measures must be developed. HI produce distinctforms of biological damage with largely unknown cancer risks. HI are thereforelikely to require countermeasures different from those developed for low LETradiation . Characterization of differences in the form of DNA damage generated byHI, particularly in the form of prDSBs and tlDSBs, is the first important step inthis endeavor. Here, we study the yields of tlDSBs and prDSBs in cells exposed to HI. We report areduction in the yield of tlDBSs stronger than that earlier reported for neutrons , but still with pronounced cell line dependence. M059K, a repair proficient human glioma cell line and M059Jits DNA-PKcs deficient counterpart , were grown in Dulbecco’s Modified Eagle’s Medium (D-MEM)supplemented with 10% fetal bovine serum (FBS), 1% non-essential amino acids and1% L-glutamine. Mouse embryonic fibroblasts (MEFs) from Lig4-/-/p53-/- and Lig4+/+/p53-/- mice  were grown in D-MEM supplemented with 10% FBS and antibiotics. Forexperiments, cells were maintained in the exponential phase of growth at37°C in a humidified incubator, in an atmosphere of 5% CO2 and95% air. To analyze induction of DSBs, cells were resuspended in serum-free medium, andprocessed for PFGE as described earlier [17, 18]. Exposures to heavy ions (HI) were carried out at the GSI Helmholtzzentrumfür Schwerionenforschung GmbH in Darmstadt, Germany. Typically cells wereseeded in 25 cm2 tissue culture flasks and were incubated for24 h at 37°C in Essen. The following day cells were transported in aninsulated container filled with warm pads to maintain the temperature of thecells as close as possible to 37°C, but without active heating. Uponarrival at the GSI, cells were promptly incubated at 37°C under standardgrowth conditions, and were allowed to recover for several hours from thetransportation stress. Cells were exposed to 1 GeV/amu heavy ions (58Fe or62Ni). The particle LET under these conditions is150 keV/μm and 175 keV/μm for 58Fe and62Ni, respectively. Dosimetry was carried out with a calibratedfarmer chamber (PTW, Freiburg, Germany). The absolute particle fluence wasmeasured with a calibrated ionization chamber (GSI, Darmstadt, Germany) at thebeam exit window and the homogeneity of the scanned field was regularly checkedusing radiochromic EBT films (Ashland,Gafchromic, USA). The irradiation fieldwas 5 x 8 cm and was generated by multiple scanning of a pencil beam acrossthe field with a dose deposition of 1 Gy per single scan. Duringirradiation cells were maintained at 4-8 °C. Before exposure to heavyions, tissue culture flasks were filled with growth media and were pre-cooled inice-water for 15 min before placement in the irradiation holder. During theactual exposure to radiation, cells were not actively cooled. After radiationexposure, cells were transferred to the laboratory in ice. Where appropriate,irradiated cells were transferred to pre-warmed (45°C) media to quicklyregenerate 37°C and start repair processes. The limited availability of HIfor biological experiments made repeat-experiments impossible. Control experiments were carried out by exposing cells to X-rays. In this case,irradiations were carried out also on ice with a Seifert-Pantak X-ray machineoperated at 320 kV, 10 mA with a 1.65 mm Al filter (effectivephoton energy, 90 keV), at a dose rate of 3 Gy/min and a distance of50 cm. Dosimetry was carried out using a calibrated ionization chamber anda chemical dosimeter. The mean LET of this type of radiation is, approximately,2 keV/μm. In certain experiments, cells were lysed before irradiation using the lowtemperature lysis (LTL) protocol described below  and were incubated in TEN buffer (10 mM Tris–HCl,pH 7.5, 2 mM EDTA, 50 mM NaCl) to analyze TLSL-evolution. Inother experiments, cells embedded in agarose blocks were irradiated inserum-free medium and were subsequently lysed by LTL. In the standard, high temperature lysis (HTL) protocol , agarose blocks were placed in lysis buffer (10 mMTris–HCl, pH 7.6, 50 mM NaCl, 10 mM EDTA, 2% N-laurylsarcosyl, NLS, and 0.2 mg/ml protease added just before use) at 4°Cand were further processed at 50°C as described earlier [17, 18]. Low temperature lysis (LTL) was carried out by maintaining samplesbelow 4°C at all times using a published protocol , as described earlier [17, 18]. Asymmetric, field-inversion gel electrophoresis (AFIGE) was carried out in gelscast with 0.5% molecular biology grade agarose (Bio-Rad) in the presence of0.5 μg/ml ethidium bromide as described [17, 18]. Gels were scanned using the "Typhoon" (GE-Healthcare) and thefraction of DNA released (FDR) from the well into the lane was quantified fromimages obtained using Image Quant 5.2 (GE-Healthcare). To monitor the kinetics of excess DSB formation at different temperatures invitro, cells embedded in agarose blocks were exposed to IR, subjectedto LTL, washed once for 1 h in TEN buffer (0.5 ml/plug) and theresulting agarose blocks containing the “naked” DNA were distributedto different tubes in the same buffer. Tubes were then transferred to waterbaths adjusted at different temperatures ranging between 10°C - 50°Cand incubated for different periods of time before washing once in 0.5X TBE andprocessing for PFGE. Previous work suggested that the contribution of TLSLs to the overall cellularDSB load decreases with increasing LET . We inquired whether this trend persists with increasing LET of theradiation employed, as is the case for HI exposures. Figure 1A summarizes results obtained after exposure of the human tumorcell line, M059K, to iron ions (58Fe). 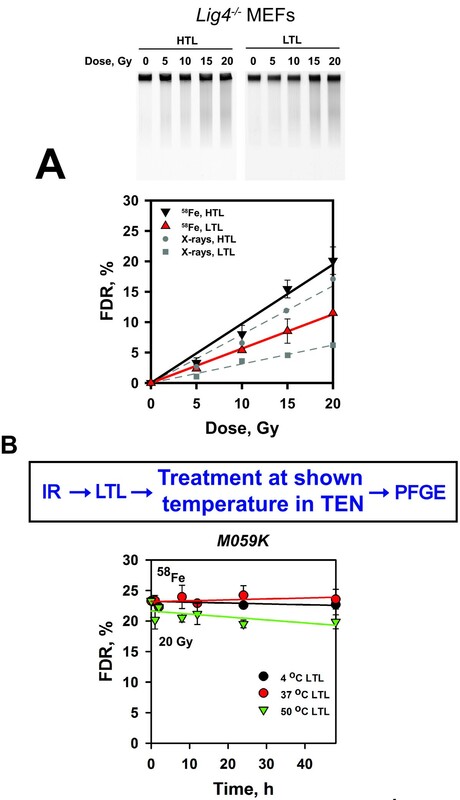 As previously reported [17, 18], exposure at 4°C of agarose-embedded M059K cells to differentX-ray doses gives after lysis with the standard HTL protocol over 40% additionalDSBs than lysis with the TLSL-preserving LTL protocol; these extra DSBs (tlDSBs)are generated by the thermal conversion within a CDS of TLSLs to SSBs. Dose response curves for the induction of DNA DSBs after 58 Fe ion irradiation in human M059K andM059J cells. Results earlier generated  with X-rays are depicted as gray symbols for comparison; theyare similar to results generated in parallel to the 58Feirradiations but for limited number of doses in the range of interest(not shown). (A) Human M059K cells were embedded in agaroseblocks and were exposed to different doses of 1 GeV accelerated58Fe ions. Induction of DSBs was assayed by asymmetricfield inversion gel electrophoresis (AFIGE), a pulsed-field gelelectrophoresis method. Irradiated agarose blocks were processedimmediately after irradiation using either HTL or LTL. Gels were scannedin a Fluor Imager and the fraction of DNA released from the wells intothe lane (FDR) was determined for different radiation doses. Datarepresent the calculated average and standard deviation from 4determinations (agarose blocks) in one experiment. (B) M059Jcells embedded in agarose blocks were irradiated and analyzed asdescribed above. Data represent the calculated average and standarddeviation from 4 determinations in one experiment. Exposure of M059K cells to 58Fe ions using the same experimentalconditions shows higher yields of DSBs than X-rays after HTL, but interestinglyno detectable modulation after analysis using LTL. This result indicates thatthe yields of tlDSBs approach zero in M059K cells exposed to 58Feions. Differences in the effectiveness at different endpoints between high and low LETradiations are conveniently compared by defining the relative biologicaleffectiveness (RBE) as the quotient of the doses required for equal effect afterexposure to X-rays and the test radiation modality. In the experiment shown inFigure 1A and because of the practically lineardose-yield curves measured, this parameter can be determined in aneffect-independent manner using the slopes of the resulting straight lines.Notably, widely different RBE values for 58Fe versus X-ray exposureare calculated when using as basis the results obtained after HTL (reflectingthe sum of prDSBs + tlDSBs) versus LTL (reflecting exclusivelyprDSBs). Specifically, a value of RBEHTL = 1.12 iscalculated using the slopes of the X-ray and 58Fe dose–responsecurves after HTL, while a value of RBELTL = 1.91 isobtained from the corresponding LTL data. The response to 58Fe noted above is reproduced in the DNA-PKcsdeficient counterpart of M059K, the M059J cells [25, 26] (Figure 1B). The X-ray data reproduceagain earlier findings [17, 18] and show that 45% more DSBs are detected after HTL as compared toLTL. On the other hand, after exposure to 58Fe, similar DSB yieldsare obtained after HTL and LTL. As a result RBEHTL = 1.39and RBELTL = 2.70 are calculated for the induction ofDSBs in M059J cells. We conclude that in a subgroup of cell lines, examples of which are M059K, andM059J, a contribution of TLSLs to excess DSB formation (tlDSBs) is marginalafter exposure to 58Fe. We noted before that the contribution of TLSL to DSBs is cell line specific [17, 18] and that this cell line specificity is also detectable after exposureto neutrons . We explored therefore whether this also holds for exposures to58Fe. The results summarized in Figure 2A indicate adecrease by 63% in the number of DSBs after LTL as compared to HTL inLig4 -/- MEFs exposed to X-rays. Yet, a decrease by 39% is also registered afterexposure of the same cells to 58Fe indicating a significantcontribution of TLSLs to the formation of DSBs. Here, anRBEHTL = 1.12 and an RBELTL = 1.83are calculated for the induction of DSBs after exposure to 58Fe. Induction of DSBs and TLSL evolution in cells exposed to 58 Fe ions. (A) Exponentiallygrowing Lig4 -/- MEFs were irradiated andanalyzed as described in Figure 1. Datarepresent the calculated average and standard deviation from 4determinations (agarose blocks) in one experiment. (B)Exponentially growing M059K cells were embedded in agarose blocks andexposed to 20 Gy of 1 GeV accelerated 58Fe ions.Irradiated blocks were lysed by LTL and incubated in TEN buffer at 4, 37and 50°C for the indicated periods of time. Cells were analyzed byPFGE. Data represent the calculated average and standard deviation from4 determinations in one experiment. We conclude that while the contribution of TLSLs to excess DSB formation isreduced after exposure to 58Fe, the level of this reduction is cellline dependent. It may be relevant to mention here that small DNA fragments, undetectable byPFGE, are produced in higher yields after exposure to high, as compared to low,LET radiation. Thus, the yields of DSBs measured after exposure to high LETradiation are likely to be underestimated. However, we consider unlikely thatthis inherent limitation in the detection of DSBs compromises ourconclusions. To further confirm the absence of TLSL induced DSBs in 58Fe exposedM059K cells (Figure 1A), we exposed agarose-embeddedcells to 20 Gy and processed them immediately by LTL to obtainagarose-embedded, “naked” DNA in which radiation-induced lesions,including TLSLs, were preserved . In these agarose blocks, TLSL stability can be studied through theircontribution to DSB formation after in-vitro incubation at differenttemperatures. The results summarized in Figure 2B show nosignificant increase in FDR for incubations in TEN-buffer at temperaturesbetween 4 and 50°C for up to 48 h. Similar experiments carried outwith cells exposed to X-rays show large increases in FDR for post-lysisincubations at temperatures above 20°C . The lack of excess DSB formation following incubation at hightemperatures of DNA from 58Fe-exposed M059K cells is in-line with thesimilar dose–response curves shown in Figure 1Afollowing HTL and LTL. Collectively, the above results suggest that cell line specific biochemicalparameters contribute to the generation of tlDSBs, even after exposure to highLET radiation. To begin characterizing parameters defining this effect, we usedLTL to lyse non-irradiated M059K cells and exposed the resultingagarose-embedded “naked” DNA to 5 Gy of 62Ni. Inthis way, a variety of lesions, including TLSLs, are generated in naked DNA keptin a defined buffer. This condition is biochemically better characterized thanirradiation of chromatin organized DNA in the cellular environment. Agarose blocks generated in this manner were transferred to TEN buffer and afterirradiation were incubated at different temperatures for different periods oftime. The results obtained are summarized in Figure 3A and show that 62Ni ions generate TLSLs in“naked” DNA that readily convert to DSBs after incubation attemperatures between 37 – 50°C, with kinetics similar to thatmeasured after exposure to X-rays . Thus, DNA organization is a key determinant of the chemicalcharacteristics and the associated thermal stability of tlDSBs not only afterexposure to low LET but also after exposure to high LET radiation. 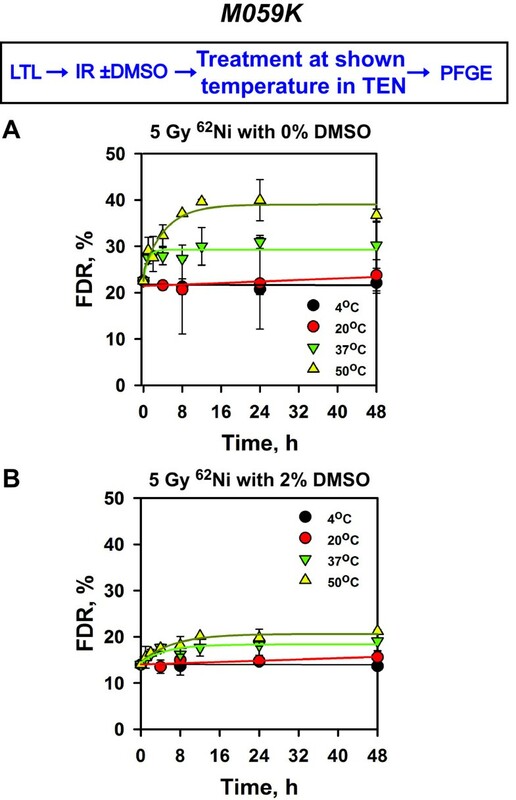 Induction of TLSL in naked DNA exposed to 62 Ni ions is suppressed by DMSO.Exponentially growing M059K cells were embedded in agarose and subjectedto LTL. Generated “naked” DNA was exposed to 5 Gy of1 GeV accelerated 62Ni ions in the presence of 0%(A) or 2% (B) DMSO. Subsequently, agarose blocks wereincubated in TEN buffer at different temperatures for the indicatedperiods of time and analyzed by PFGE. Data represent the calculatedaverage and standard deviation from 4 determinations (agarose blocks) inone experiment. We inquired whether indirect radiation effects by water radical productionunderpin the TLSL-dependent formation of excess DSBs after incubation at hightemperatures. For this purpose we carried out the “naked”-DNAexperiment described above in the presence of 2% DMSO, an effective scavenger of•OH radicals. The results summarized in Figure 3B indicate that when irradiation of naked DNA is carriedout in the presence of DMSO, subsequent incubation at high temperatures reducesthe yields of excess DSBs generated, pointing to a contribution of•OH in the production of TLSLs. We conclude that•OH has an essential contribution to the generation oftlDSBs when irradiating “naked” DNA. This result cannot be directlyextended to cell irradiation because the chromatin organization of the DNA isprotecting it from •OH attacks. In wild-type M059K cells, total DSBs (analyzed by HTL) induced by 1GeV/amu58Fe are repaired with nearly the same efficiency as thoseinduced by X-rays (Figure 4A); however, moreunrepaired DSBs are detected between 2 – 8 h after exposure to HI.Within statistical variation, a similar response is also observed when DSBrepair kinetics is measured by LTL to specifically assay for prDSBs(Figure 4B). Similar overall trends are alsoobtained when analyzing wild type MEFs exposed to 62Ni ions(Additional file 1: Figure S1). DSB repair kinetics of human M059K cells exposed to 58 Fe ions or X-rays. (A)Exponentially growing M059K cells were exposed to 20 Gy of X-raysor 58Fe ions and returned to standard incubation conditionsfor repair. Agarose blocks were prepared and lysed by HTL (A) orLTL (B) before processing by PFGE. Plotted is relative repair asa function of repair time. To calculate relative repair, FDR atdifferent time points was divided by the FDR measured at the 0 htime point (this value was obtained from the dose response curve). Datarepresent the calculated average and standard deviation from 4determinations in one experiment. In DNA-PKcs deficient M059J cells (Figure 5A), where D-NHEJ is defective and repair of DSBs is mainly mediated byB-NHEJ [27–29], repair of 58Fe-induced total DSBs is compromised slightlystronger than in M059K cells. Thus, the increased DSB complexity of58Fe generated DSBs appears to compromise processing by B-NHEJ toa greater extent than processing by D-NHEJ. DSB repair kinetics of human M059J cells exposed to 58 Fe ions or X-rays. Other details asin Figure 4. When DSB repair kinetics is measured in M059J cells using LTL to focus analysison prDSBs and tlDSBs forming during repair, complex kinetics is observed afterexposure to X-rays (Figure 5B): The load of DSBsrises at early times and decays subsequently. This structure derives from thefact that the kinetics reflects not only the processing of prDBSs by B-NHEJ, butalso the gradual development and subsequent processing of tlDSBs (see  for a more in-depth analysis of the components involved). It is notdetectable in repair proficient M059K cells, either owing to the higherefficiency of DSB repair, or to differences in the kinetics of tlDSBproduction. Repair kinetics after exposure to 58Fe ions lacks this structure, inline with the observation that only few tlDSBs are produced in M059J cells afterHI radiation (see Figure 1B). We do not have anexplanation why similar levels of residual damage is observed after 2 h incells exposed to X-rays and 58Fe when using LTL, but this may reflectanalysis artifacts. These may originate from shifts in the yields of prDSBs andtlDSBs with increasing LET, as well as from the normalization applied (to showpercent of initial damage). Qualitatively similar results are also obtainedafter exposure of Lig4 -/- MEFs to 62Ni ions (Additional file 2: Figure S2). 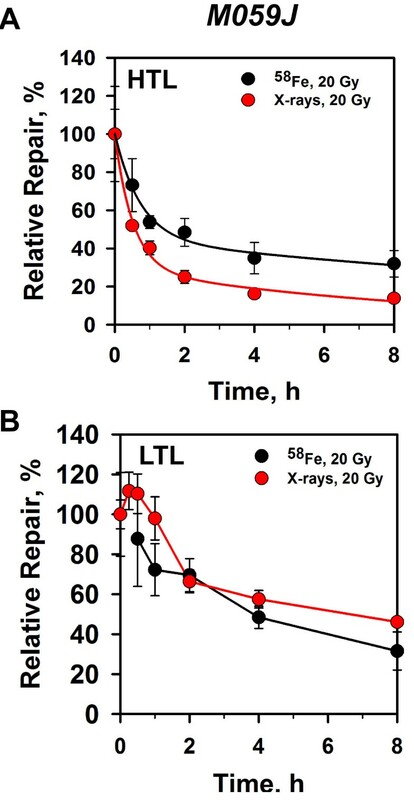 However, with these cells and probably as a consequenceof the significant induction of tlDSBs after exposure to HI (Figure 2A), repair of 62Ni induced DSBs is compromisedas compared to X-rays when analyzed by LTL (Additional file 2: Figure S2B). In an effort to connect the above observations on the induction and repair ofdifferent forms of DSBs with the cell inactivation potential of HI, cellsurvival was determined. The results obtained with M059K and M059J cells aresummarized in Figure 6. Shown in the figure forcomparison are also results previously reported with the same cell lines afterexposure to X-rays, in the presence or absence of 10 μM wortmannin toinhibit D-NHEJ . M059K cells exposed to X-rays show the typical dose response,characterized by a shoulder at low radiation doses followed by an exponentialregion at higher doses. 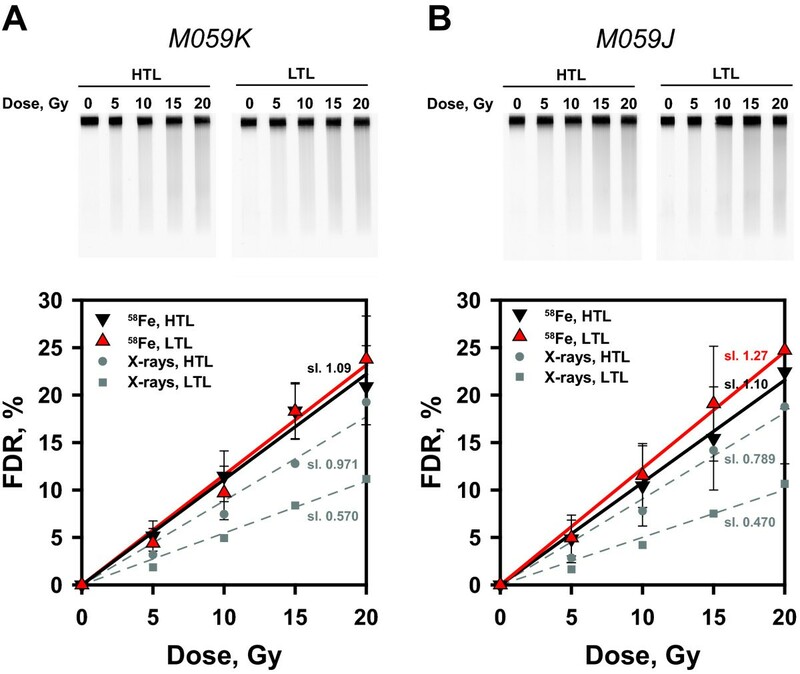 Wortmannin-induced inhibition of D-NHEJ stronglysensitizes M059K cells to X-rays and leads to an exponential survival curve.Notably, M059K cells exposed to 58Fe ions show cell survivalpractically indistinguishable from that of wortmannin-treated cells. From theseresults RBEs of 3.8, 2.5, and 2.3 are calculated at surviving fractions of 0.1,0.01, and 0.001, respectively. 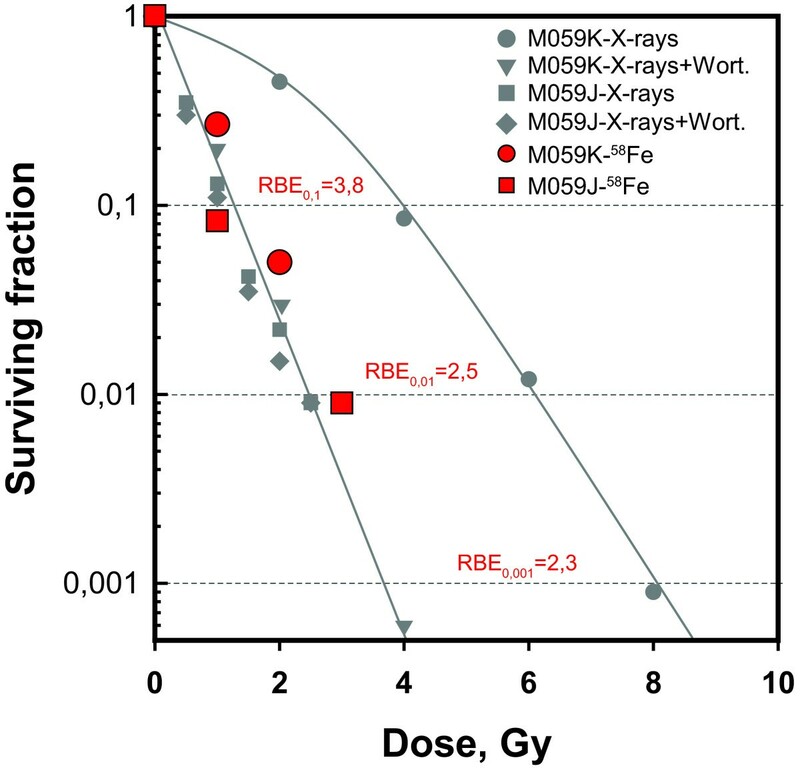 Survival curves of logarithmically growing M059K and M059J cells asmeasured by colony formation after exposure to 1 GeV 58 Fe ions (red symbols). Shown(gray symbols) for comparison are also results of experiments previouslyreported  with these cells after exposure to X-rays in the presence orabsence of 20 μM wortmannin. The figure also shows RBE valuescalculated at the indicated levels of cell survival. The lines drawnfollow the early data points  and are given as basis for comparisons with the resultsgenerated with 58Fe. M059J cells, as a result of their deficiency in D-NHEJ, are intrinsically highlyradiosensitive and wortmannin has no further radiosensitizing effect. Notably,58Fe ions are killing these cells with efficiency practicallyindistinguishable from that of X-rays, which leads to RBEs of approximately 1.This observation is in line with earlier reports pointing to a D-NHEJproficiency requirement for high LET mediated radiosensitization [30–33]. There is evidence for the induction by IR of thermally labile DNA lesions, whichcontribute to DSB formation (tlDSBs), albeit in a delayed manner, even in cellsmaintained under physiological temperatures (see Introduction). As a result of thisdelayed formation, the total load of DSBs generated in an irradiated cell (tDBSs)will be the sum of those induced promptly, i.e. those present immediately afterirradiation (prDBSs), and those generated within a non-DSB-CDS by the conversion ofa TLSL to a SSB (tlDBSs); thus, tDSBs = prDBSs + tlDBSs. Itis not known whether prDBSs and tlDBSs are detected and processed by the cell withthe same efficiency and, actually, arguments can be developed why this may not bethe case [17–19]. If cells detect and process differently prDBSs and tlDBSs, it is likelythat their biological consequences will also be different. Experimentally, the yields of prDBSs can be determined by lysing cells immediatelyafter irradiation using low temperature (0 – 4°C) lysis protocols (LTL),whereas the standard 50°C lysis allows determination of tDBSs. The differencebetween tDBSs – prDBSs yields gives then estimates regarding the yields oftlDBSs. There is evidence that IR induces a spectrum of TLSLs with different levelsof chemical and thermal stability . This raises the question how to determine the biologically relevantsubset of tlDBSs, i.e. the subset that also converts to a DSB in cells maintainedunder physiological conditions. There are at present no established methods allowingthe reliable determination of the biologically relevant subset of tlDBSs. 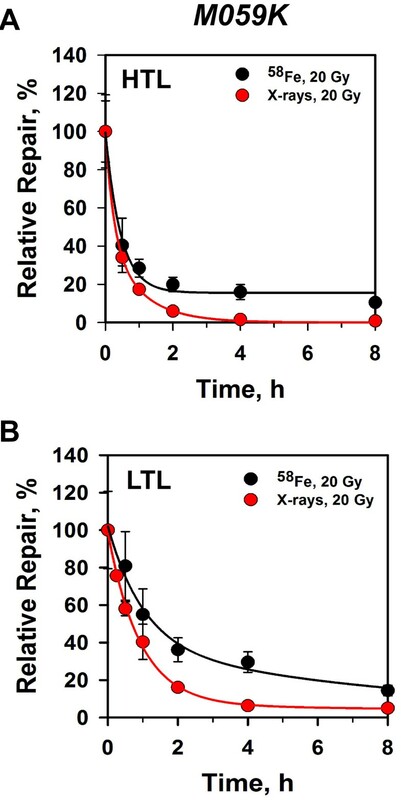 However,as a first approximation, we assume that conversion of TLSLs to breaks is similar incells maintained at 37°C and cells analyzed by lysing at 50°C immediatelyafter exposure to IR . Using the above outlined conceptual and experimental background we investigate herehow the yields of prDBSs and tlDBSs change in cells exposed to HI. The resultspresented in the previous section extend trends previously reported for neutrons  and confirm a strong, inverse LET dependence of the yields of prDBSs andtlDBSs. Specifically, while exposure to HI causes a strong reduction in the yieldsof tlDBSs as compared to X-rays, it causes a strong increase in the yields ofprDBSs. These opposing effects partly compensate each other and as a result theyield of tDSBs changes only modestly with increasing LET. This is in line with theobservation that RBEs close to 1 are frequently measured for the induction of DSBs . Notably, our results demonstrate that when prDBSs are specificallydetected by LTL protocols, much higher RBE values are measured that are approachingthose obtained for cell survival (Figure 6). This is apotentially highly significant observation that warrants further investigations. Notably, the RBE values for DSB-induction after exposure to high LET radiation, asmeasured by γ-H2AX foci formation in diverse cell lines, is also very close toone ( and references therein). This is significant as it shows, in line withour earlier work , that the load of DSBs the cell ultimately “sees” is close tothat measured by HTL. If cells were only detecting prDBSs, as it is often assumed,two to three times more DSBs (i.e. γ-H2AX foci) would have been expected afterexposure to high LET radiation than after low LET radiation. On the other hand, italso demonstrates that the γ-H2AX marking of DSBs does not differentiate levelsof DSB complexity. The increase in prDSBs observed with increasing LET can be explained by the expectedincrease in the size of ionization clusters (more ionizations within the samevolume) that leads to the generation of higher complexity CDS, i.e. the presence ofa higher number of lesions at the site. As a result of this increase in lesionnumber within a CDS it becomes more likely that prompt SSBs will combine to form aprDSB. Even if TLSLs are present in these CDSs, their subsequent conversion tobreaks will remain inconsequential with reference to DSB formation. The chemicalreactions that convert a TLSL to a SSB remain uncharacterized, but may includebase-catalyzed hydrolysis or oxidation . As noted above, TLSLs are not a uniform chemical entity but rather a spectrum oflesions with different chemical and thermal sensitivities. The probability of theirformation from clusters of ionization events and radical attacks, as well as theirchemical evolution may be decisively determined by the chemical environment in theirimmediate vicinity. In this respect, it is likely that the details of DNAorganization in chromatin within a CDS, including all participating histone andnon-histone proteins, will affect decisively not only the induction of TLSLs butalso their evolution to tlDBSs. This theoretically anticipated dependence providesalso a first explanation for the surprisingly large differences observed in theyields of tlDBSs among different cell lines both after exposure to high as well asto low LET radiation [17–19]. Furthermore, the large differences in LTL dose response curves amongdifferent cell lines contrasts the surprisingly similar HTL dose response curves andpoints to cell line specific variation in the chemical environment in the vicinityof a clustered ionization hitting the DNA that alters the probability of generationof a prDSB. While the selection of cell lines used here reflects the intellectual evolution ofthe TLSL problematic in our work during the past few years, future work willcertainly benefit from a hypothesis oriented selection of cell lines and an analysisof TLSL production and evolution after treatments that alter chromatin organization.It is also worth pointing out that the differences between cell lines persist evenafter exposure of cells to high LET radiation  (see above). The results discussed above demonstrate that the energy deposition pattern ofradiation is not the sole determinant of the yields of tlDSBs. Small differences inDNA organization may cause changes in the induction and the subsequent chemicalprocessing of TLSLs and may strongly affect the form of DSBs induced – evenafter exposure to high LET radiation. Worth noting is also that the differencesobserved in lesion induction and evolution among cell lines exposed to HI arelargely eliminated if “naked” DNA is irradiated instead of cells. Collectively, the results presented here, as well those published before [17–19], point to an unexplored dimension in the production of DNA damage by IR.Temporal evolution of complex radiation damage to DSBs, and the suggested role ofDNA organization in this evolution go beyond current concepts of DNA damageinduction and repair  and indicate aspects of DDR that warrant further investigations. It is tempting to speculate that transient, chemical stabilization of TLSLs, mayallow repair of SSBs and base damages within a non-DSB CDS, so that subsequentconversion of the TLSL to a DNA break will not cause a DSB. Such agents may findapplication in radiation protection on earth and in space, as well as in thedevelopment of new strategies in radiation oncology [21, 36, 37]. Work supported by grants from the “Bundesministerium für Wirtschaftund Technologie“(BMWi: ESA-AO-08-IBER, 50WB1229) and the„Bundesministerium für Bildung und Forschung“(BMBF: 02NUK005Cand 03NUK001B). The authors are indebted to Fred Alt and Joan Allalunis-Turnerfor cells. SKS designed and performed the PFGE experiments, analyzed and interpreted the resultsobtained and contributed to the preparation of the manuscript. ABT designed andperformed the cell survival experiments. EM performed cell survival experiments andhelped in the preparation of the manuscript. BJ and GTS helped design theirradiations with heavy ions at the GSI and assisted in the interpretation of theresults obtained, as well as in the preparation of the manuscript. GI conceived theproject, assisted in the experimental design, interpreted the results obtained andwrote the manuscript. All authors read and approved the final manuscript.